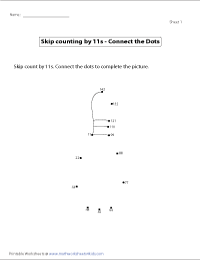 These worksheets provide learning aids to practice skip counting by 11s. 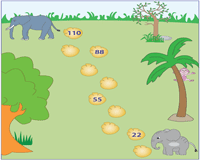 This page contains skills based on number lines, counting with pictures, complete the path, missing numbers, maze and connect the dots. 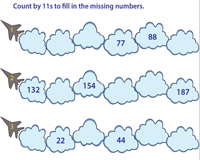 Master skip counting in 11s with these display charts presented here. 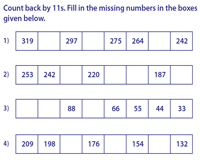 Reinforce forward counting in 11s with the partial and blank charts included here. 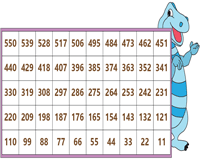 The backward skip counting display charts assist students in grasping the concept easily. Reverse skip count by 11s and complete the partially filled and blank charts featured here. 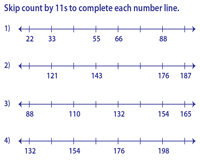 Skip count by 11s to complete each number line. There are six sheets available here. There are 11 items in each group. Count by 11s to find the total. Carol and the calf need help to find the way to the moon and the mother elephant respectively. Skip count by 11s to trace the path. Three or four numbers are missing in each problem. 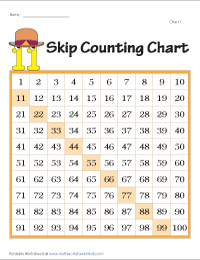 Skip by 11s to fill in the missing numbers. 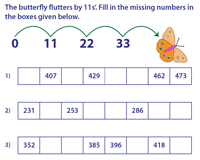 Apply skip counting forward and backward to fill in the missing numbers. 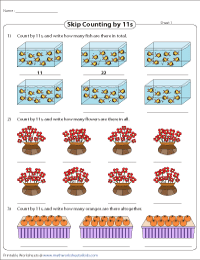 Skip counting concept is illustrated in each worksheet. Three sheets are available here to learn how to skip count backwards by 11. Children master skip counting when they can count forward and backward. An engaging maze game help children learn skip counting by 11s. 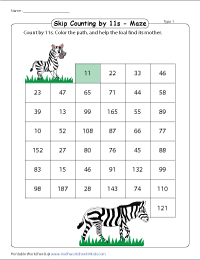 Start at 11, count by 11s, color the path and solve the puzzle. Count by 11s to connect the dots and complete the picture. Color the picture to showcase your talent.